This engine horsepower calculator can answer your question - what is my car's horsepower? With 2 different calculation methods, based on the weight of a vehicle and elapsed time, or weight and final speed after driving the quarter mile, this engine horsepower estimator gives you precise results in four different units (including horsepower and watts). In the following article, we explain what is a horsepower, how to calculate horsepower, and what is horsepower to watts conversion. More interested users can take a look into horsepower vs torque comparison as well as check the examples of high-performance cars. Let's fasten your belt, start the engine and drive into the horsepower world! The term horsepower is commonly known, and most of us associate it with cars. Usually, people want to have fast vehicles with powerful engines. But what is horsepower actually? And what is its direct conversion into the car performance? The Scotch engineer James Watt (1736-1819) invented the unit of horsepower. He is famous for his work on improving the performance of steam engines. Watt worked with ponies that lift coal at a coal mine, and that prompted him to think about the power generated by those animals. He found that one pony could do 22 000 foot-pounds of work per minute. He raised up this value by 50 percent and linked it with horsepower which equals 33 000 foot-pounds of work in one minute. This unit is arbitrary and it has evolved through the years to its conventional form, which usually defines the power of engines (commonly applicable for cars). Horsepower (HP) is a unit of measurement of power. HP equals to a work done by a horse that raises 330 pounds of coal to a height of 100 feet in a minute, or equivalently, 1000 pounds to 33 feet in one minute. In other words, your engine have a 1 horsepower if it corresponds to the power of horse lifting 550 pounds to 1 foot in 1 second. Therefore, horsepower is a unit expressed in the foot-pound-second (fps) system that fulfills the relation 1 HP = 550 foot-pounds per minute. Accordingly, for SI units exists two common definitions - mechanical (imperial) horsepower which equals 745.7 watts, and the metric horsepower that equals approximately 735.5 watts. 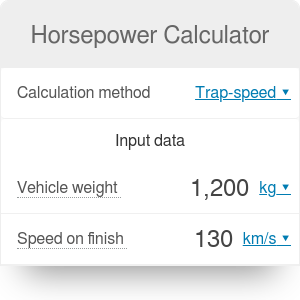 This horsepower calculator uses two different measurement methods for horsepower estimations - elapsed time method and trap-speed method. Both bases on a quarter-mile (402.3 m) ride, and should be done with maximal car power immediately after the start. Vehicle weight parameter, used for the calculations, should include the weight of the vehicle itself, driver, passengers, all the car liquids and anything else of significant weight. horsepower = weight * (speed / 234)³. Note, that in our calculator you can freely switch between metric and imperial units, accordingly to your preferences. The mechanical engine power is usually expressed in units of mechanical horsepower or watts. So, what is the relation between these two? A power level of 1 HP approximately equals to 746 watts (W) or 0.746 kilowatts (kW). And vice-versa, to obtain HP from kilowatts, multiply the power in watts by 0.00134 or power in kilowatts by 1.34. Horsepower units are commonly used to express mechanical power, very rarely for other forms of energy. To better understand this conversion, take a look at the following example: since 1 horsepower equals 746 watts, putting a horse on a treadmill with the ability to produce 1 HP will result in generating continuously 746 watts. All the time, while talking about cars you're messing around with horsepower and torque terms. You can see both in every vehicle specification, but do you understand the practical difference between these two? Torque is a force applied at something at a distance. In engine, it is a piston that pushes a crankshaft, through the connecting rod, and forcing it to rotate. Pistons are moving due to the internal combustion of gas in the cylinder. The more torque an engine produces, the greater its ability to perform work. 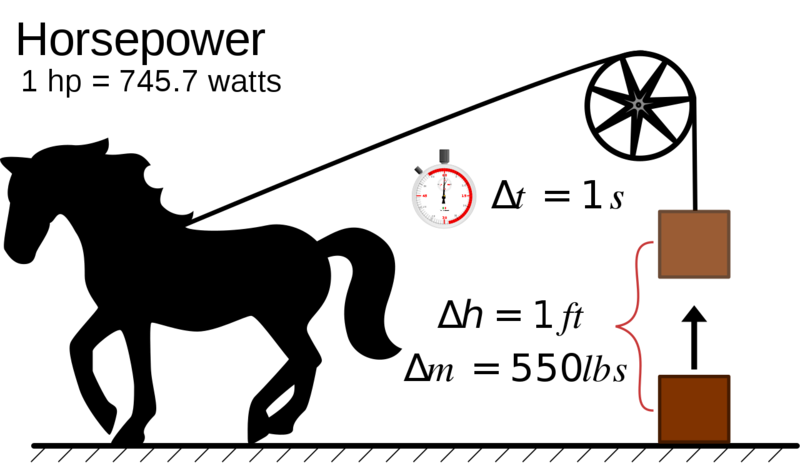 Torque is expressed in units of pound-feets and newton-meters. Horsepower and torque are just like the siblings, but separated. They are closely related, however, don't have much in common. Which is better? Well, both are necessary. Torque is crucial for every engine to operate, but horsepower is the parameter that allows to distinguish the better engine from a good one. Do not perform measurements on public roads (streets, highways, etc.). These activities on public roads might endanger a driver, passengers, as well as pedestrians and anyone else in the vicinity (car crash). Moreover, during the runs, the achieved speeds might be illegal because of speed limits on public roads. Use the legal places only to perform car run measurements. These might be dedicated race circuits, drag strips or raceways on airports during special events. Check your car before the measurements. Inspect the technical condition of your vehicle including tires treads and air pressure, breaks, engine condition and airbag system. Be sure that drivers and service people are aware of what they are doing in case of proper measurement activities. Lack of significant knowledge may lead to serious life danger. Note, that for both measuring methods, elapsed time and trap-speed, you should apply a maximal output of an engine, respectively from the start. In the case of the first one, enter the vehicle weight and the elapsed time on the quarter mile distance. In the case of the second one, input vehicle weight as well, and the speed registered at the end of the quarter-mile run. Results of your car power are displayed below the calculator. You can see results in four distinct units - mechanical horsepower, metric horsepower, watts and foot-pounds per second. On a daily basis, we usually deal with civil cars, mainly intended to help people move from point A to point B. But there are also some other cars, which are dedicated mostly to provide fun. They are called high performance cars because of their performance abilities over an average. In this type of vehicles, the power to weight ratio is very beneficial - less weight allows for better acceleration. 2018 For Mustang GT is a great example of a high-performance car. With its 460 HP (420 lb-ft of torque) it hits 60 mph in under 4.0 seconds! Mustang GT weighs 3706 lb (1681 kg), what gives 0.12 power-weight ratio. Horsepower Calculator can be embedded on your website to enrich the content you wrote and make it easier for your visitors to understand your message.